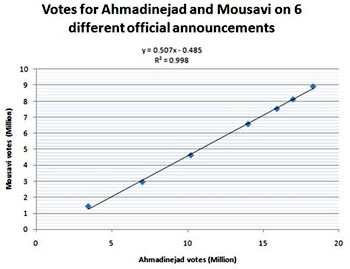 The chart on the right comes from Andrew Sullivan, and it shows the size of the announced vote for Mahmoud Ahmadinejad in six different official announcements on Saturday. As Andrew says, “They didn’t even attempt to disguise the fraud.” A real vote count would have shown at least a little bit of variation during the day, not the laser-like precision of this one, which shows Ahmadinejad winning almost exactly two-thirds of the vote against reformist challenger Mir Hussein Mousavi every step of the way. I was at a book party for Bob Wright’s The Evolution of God last night, and even then it was obvious that the Interior Ministry was probably rigging the vote. One of the topics of conversation was: when autocracies decide to do something like this, why do they do it so clumsily? Why not give Ahmadinejad 52.7% of the vote, which would be at least within the realm of reason? Or force a runoff and let Ahmadinejad win a week from now? Why perpetrate such an obvious fraud? Hard to say. Maybe it’s just too hard to orchestrate something more believable. Maybe, against all evidence, they believe that smashing victories are always more convincing than close ones. Maybe it’s just rank panic and stupidity. It’s a mystery — and a counterproductive one, too: there isn’t a person on the planet who thinks that Ahmadinejad could have won two-thirds of the vote with a turnout of 85%, and the possibility of inciting an internal revolt is a lot higher with a barefaced fraud like this than it would be with something a little more subtle. On the other hand, maybe we’re looking at this through the wrong lens. Obviously something about Mousavi started to badly spook the powers-that-be during the past week, and maybe they decided something needed to be done about it. Maybe they wanted to provoke a round of violence from Mousavi’s supporters as an excuse to lead a crackdown on dissidents. And what better way to do that than to make the election rigging so obvious even a child could see it? Maybe. My crystal ball is cloudy, though. I’m not sure what to make of this. Just as a first reaction, this post-election situation looks to me like a crime scene. And here is how I would reconstruct the crime. As the real numbers started coming into the Interior Ministry late on Friday, it became clear that Mousavi was winning….The ministry must have informed Supreme Leader Ali Khamenei, who has had a feud with Mousavi for over 30 years, who found this outcome unsupportable. And, apparently, he and other top leaders had been so confident of an Ahmadinejad win that they had made no contingency plans for what to do if he looked as though he would lose. They therefore sent blanket instructions to the Electoral Commission to falsify the vote counts. This clumsy cover-up then produced the incredible result of an Ahmadinejad landlside in Tabriz and Isfahan and Tehran. UPDATE 2: The election still seems likely to have been rigged, but this chart apparently isn’t evidence for it one way or the other. Details here.